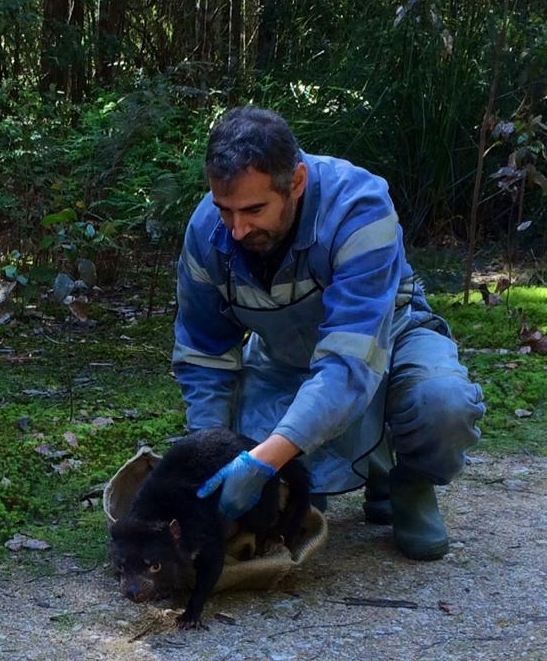 Researcher Jean-François DuCroz releases a Tasmanian devil after data collection. Conservation of threatened species depends on collaboration. Academic researchers and industry practitioners from a range of fields should work together to ensure that their efforts have the greatest possible impact in the fight to prevent extinction. And those efforts will be more effective with the support of the broader community. The Carnivore Conservancy puts this philosophy into practice by working closely with several research affiliates and research partner organizations and by actively engaging in the community through our educational outreach program. Photo © M. Parrott 2014.